Institute of Banking Personnel Selection IBPS has released the Interview Call Letter for the post of IBPS RRBs Officers Scale-I (PO), II and III. The Online written Prelims exam for IBPS RRB PO was held in the month of September 2017 followed by Mains Exam on 05th November 2017. 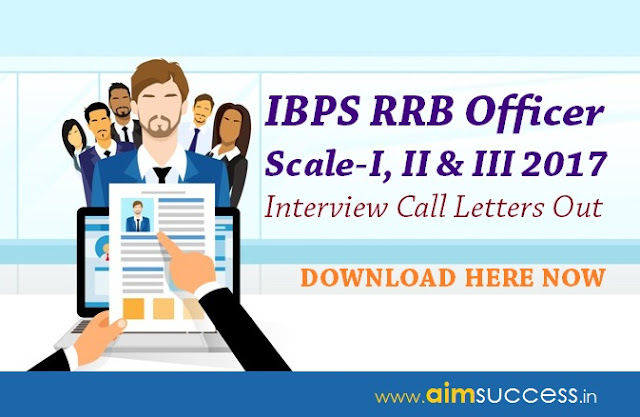 Candidates who qualified the Mains exams of IBPS RRB Officer Scale-I or the single level exams of Officer Scale-II and III can now download their RRB Interview Call letters from the links given below. Enter your Registration number or Roll number and Date of Birth or Password as mentioned in your call letter.